Who Will Be the Winner of the Next 2015 GOP Debate? Subject: Who Will Be the Winner of the Next 2015 GOP Debate? Millions of Americans are set to tune into the CNN republication debate today. This marks a second scrap among the GOP's hotly contested field of 2016 presidential candidates. The first GOP debate was held by FOX News on Aug. 6 and drew 24 million viewers – making it the highest-rated primary debate in television history. Just like in that instance, the CNN republication debate features both "undercard" and "prime-time" debates. Who Is in the Next GOP Debate Lineup? This will mark the second clash between the hotly contested GOP field in 2015. Similar to the first debate on FOX News on Aug. 6, there will be two separate debates. One "undercard," or "kids' table," debate will be held at 6 p.m. ET and finish at 7:45 p.m. The "prime-time" battle will begin at 8 p.m. ET. The "prime-time" CNN debate kicks off at 8 p.m. It features the 11 top candidates. A fresh Washington Post/ABC poll released Sept. 14 shows Trump (33%) and Carson (20%) leading the GOP field. Last week, former Texas Gov. Rick Perry became the first casualty of the now 16-person GOP race. "Today I am suspending my campaign for the presidency of the United States," Perry announced to conservative activists in St. Louis, Missouri on Friday, Sept. 11. Former Virginia Gov. Jim Gilmore, who participated in the Aug. 6 undercard debate, did not meet the criteria for inclusion in Wednesday's CNN debate. He failed to meet the requirement to average 1% support in any three polls released during the two-month window. CEO Pay: Over the weekend, Donald Trump lampooned sky-high CEO pay, calling it "disgraceful." While Trump didn't offer details of how to change pay, he said the current system of corporate boards being a check on CEO compensation isn't working because most board members are close with the top boss. Tax Reform: Ben Carson has been busily supporting the idea of a flat-tax system. That would mean billionaires and minimum wage workers would be taxed at the same rate, which he suggests should be between 10% and 15%. Could Trump Rebound from His GOP Debate Performance? 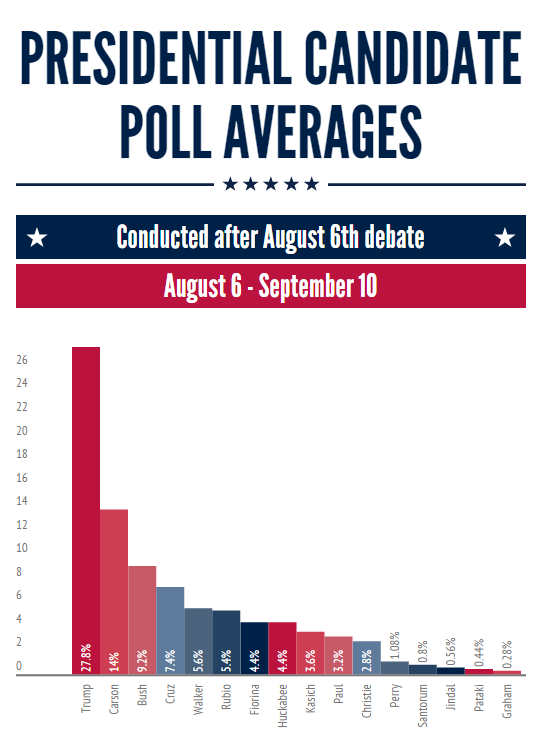 The first GOP debate was held on Aug. 6 and was hosted by FOX News. Money Morning Special Contributor Michael E. Lewitt said after the first GOP debate that the "love affair" many Republicans have with Trump is troubling. "[Trump is] a serial bankrupt whose flamboyance, bombast, and personal life resembles former Italian Prime Minister Silvio Berlusconi. Of the candidates in the main event last night, Donald Trump clearly did himself the most damage with his nasty and misogynistic response to Megyn Kelly's question regarding his history of demeaning remarks to women." CNN agreed, saying Trump may have hurt his chances for a run at the White House after the first GOP debate, coming off as "narcissistic and boorish." The New York Times said Trump might have had the weakest performance among the 10 in the Aug. 6 debate, as he consistently faced pointed questions, but didn't always have satisfactory answers. Still, The Times noted that this "may not be the end of his surge." "Trump will implode, but he's pushing the Republican field to be more aggressive on issues important to the American people, like immigration, which in the end could be a positive thing," Lewitt continued. Indeed, Trump was the center of the debate from the start and still remains a formidable, albeit unlikely, Republican candidate. Whether he was the "winner" or "loser" is up for debate itself, but he was undoubtedly the biggest story. Money Morning: Warren Buffett on Trump Economics: "I Haven't Heard Anything I Disagree With"
Money Morning: Donald Trump on Black Monday: "Get Smart, U.S.A."
CNN: So, Who Won the Debate? Stay informed on what's going on in the markets and the #GOPDebate by following us on Twitter @moneymorning.